Four-time world boxing champion Carl Froch, the first black footballer to play for England, Viv Anderson, and Comic Relief co-founder Lenny Henry are among those to receive an honorary award from Nottingham Trent University this week. 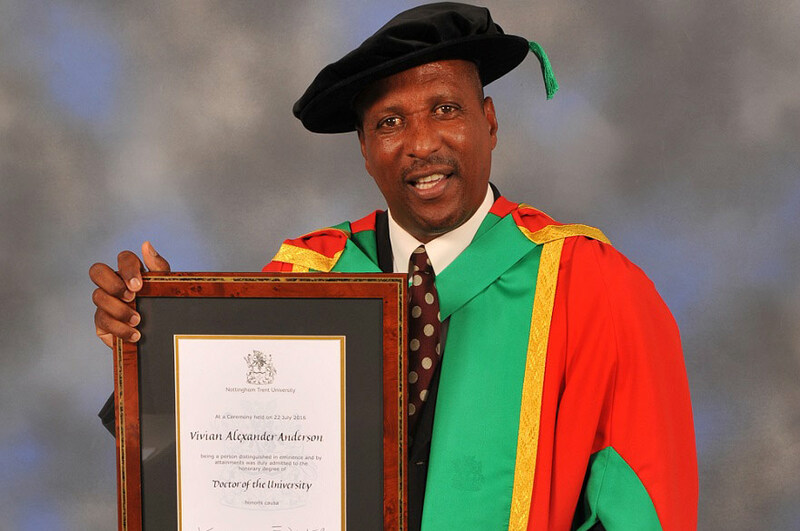 Four-time world boxing champion Carl Froch; the first black footballer to play for England, Viv Anderson, and Comic Relief co-founder Lenny Henry are among 11 candidates who will receive an honorary degree or award at Nottingham Trent University this week. Other recipients include former Secretary of State for Children, Schools and Families, Ed Balls; fundraiser Claire Lomas; global business management expert Ann Francke and British sports ambassador Baroness Sue Campbell. Nottingham Trent alumni, sculptor and "Hive" creator Wolfgang Buttress, Sky News journalist Stephen Dixon and Law Society President Jonathan Smithers will also receive honorary degrees in recognition of their contributions to their respective professions. Receiving the Nottingham Trent Students' Union Honorary Award is Notts County Ladies FC player and England international Laura Bassett. Nottingham Trent University Chancellor, Kevin Cahill CBE, and Vice-Chancellor, Professor Edward Peck, will be conferring the degrees at a number of graduation ceremonies at the Royal Concert Hall throughout the week (w/c July 18). Professor Peck said: "I am delighted to be conferring honorary degrees on this year's very distinguished recipients. In some cases it will be the second time they have attended a graduation ceremony here as we welcome back several of our alumni. Those selected to receive these degrees all have strong links to our University, the City and County of which we are a part or they embody our core principles. In many cases they possess all three. We hope they will help to inspire this year's graduates and future students and continue their relationship with NTU into the future." Today (July 18) two ambassadors of sport will receive their honorary degrees – Baroness Sue Campbell and Carl Froch MBE. Nottingham-born Froch currently works as a boxing analyst. He is a four time super-middleweight world champion, having won the WBC title twice, as well as the IBF and WBA titles. Baroness Campbell is best known for her work as Chairman of UK Sport and her leadership of the British Olympic efforts, which resulted in Team GB increasing its tally of golds from just one in Atlanta 1996 to a staggering 29 at London 2012. Sir Lenny Henry will receive his degree on Wednesday when he will be reunited with Comic Relief's former chief executive and now NTU Chancellor, Kevin Cahill. He will receive his award in recognition of his contributions to British comedy and drama, along with his achievements in international charity work. Creating the University of the Future has five main ambitions: Creating Opportunity, Valuing Ideas, Enriching Society, Connecting Globally and Empowering People.